Get ready for the second part of this Kitten’s report! The first part (online enforcement and black box tinkering), can be reviewed here. 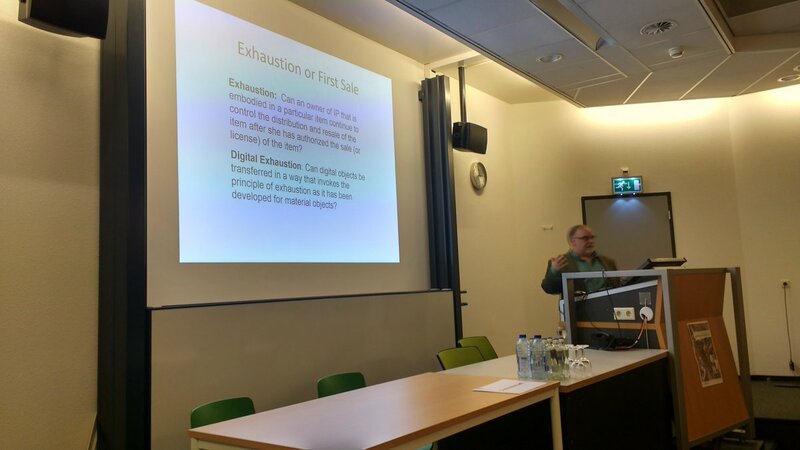 Prof. Dan L. Burk (University of California-Irvine School of Law) provided an overview of cases which addressed whether digital exhaustion applies to digital works protected by copyright exists under US and EU law. By this is meant whether the principle of exhaustion, whereby the rightsholder cannot hinder the further distribution after the first sale authorized by the IP owner of a work protected by copyright, applies as well to digital works. Prof. Burk highlighted that this topic has taken on a polemical character due to the social expectation of purchasers being able to resale digital copies of works, lawfully acquired, which are protected by copyright. From a US perspective, Prof. Burk started with the case, Capitol Records, LLC v. ReDigi Inc, 934 FSupp2d 640, which considered whether the first sale doctrine defense applies to the resale of a digital music file in the marketplace ReDigi. The Court ruled that the first sale doctrine defense did not apply in this case because it only covers material items; and ReDigi was “distributing reproductions of the copyrighted code embedded in new material objects”, rather than distributing any material object. From a European perspective, Prof. Burkfirst highlighted the outcome of the case UsedSoft GmbH v Oracle International Corp. case, C-128/11, ECLI:EU:C:2012:407, which involved the resale of “used” licenses for the Oracle’s downloadable software in the market UsedSoft. The Court ruled that under the Software Directive, there is digital exhaustion when “the copyright holder … [in] authori[zing] … the downloading of that copy from the internet onto a data carrier, has also conferred … a right to use that copy for an unlimited period … in return for payment of a fee intended to enable the rightholder to obtain a remuneration corresponding to the economic value of that copy of this work...”. The Court also stated that the Software Directive is lex specialis in relation to the provisions of the InfoSoc Directive. The second case discussed by Prof. Burk was Art & AllPosters International BV v Stichting Pictoright, C-419/13, ECLI:EU:C:2015:27, which involved the sale of canvas reproduced images protected by copyright, which were transferred from posters without consent from the IPR owners. The Court ruled that exhaustion under the InfoSoc Directive does not apply if “a reproduction of a protected work, after having been marketed in the European Union with the copyright holder’s consent, has undergone an alteration of its medium … and is placed on the market again in its new form”. The Court also stated that exhaustion applies to the tangible object containing the work. Prof. Burk then discussed Vereniging Openbare Bibliotheken [VOB] v Stichting Leenrecht, C-174/15, ECLI:EU:C:2016:856, which involved whether public libraries are allowed to lend a digital copy of a book under the Rental and Lending Rights Directive. The Court ruled that the lending of a digital copy of a book is covered by the Rental and Lending Rights Directive when such copy is placed on the server of a public library. Only one copy may be downloaded during the period for which the copy is being loaned; the user is allowed to download it onto his computer only during such period and cannot use it after the period has expired. The Court also stated that public lending is “different in nature from a sale … since the lending right remains one of the prerogatives of the author notwithstanding the sale of the physical medium containing the work”. Prof. Burk observed that the outcomes of these three cases might suggest that exhaustion applies in a different way, depending under which Directive the work is protected: if the work is protected under the Software Directive and requirements for exhaustion are fulfilled, digital exhaustion applies. If the work is protected under the InfoSoc Directive, exhaustion is linked to the sale of the physical object containing the work. Nevertheless, Prof. Burk remarked that the existence of digital exhaustion under the InfoSoc Directive still remains unresolved. Dr. Kunbei Zhang (Chongqing Technology and Business University) and Prof. Aernout Schmidt (Leiden University) presented the outcomes of their research that focused on the USA, in which they analyzed how environmental factors (e.g., scientific, economic and social) have impacted on the legal system with respect to the fair use defense. The methodology applied was the implementation of agent-based model simulations, which consist of “computational models for simulating the actions and interactions of autonomous agents with a view to assessing their effects on the system as a whole”. A database of fair-use case law from 1990 to 2017 served as the foundation for postulating certain hypotheses, whereby these data are inputted into the model to perform simulations under different parameters and then to assess the results. The parameters used consisted of four approaches and four categories. The approaches were scientific, considering innovation as the facilitator of infringing behavior; economic, considering the collapse of the traditional music industry and the rise of streaming services; social, considering sharing as both cooperation and theft; and legal, considering judicial decisions and rules governing copyright issues. Meanwhile, the categories focused on the reactions to the innovations and consisted of adopting, adapting, excluding and fighting as behaviors. Simulations were performed from the vantage of three different moments in the history of music: the emergence of CD’s, music file-sharing, and streaming. Dr. Zhang and Prof. Schmidt then analyzed the results, concluding, inter alia, that legal scholars have overestimated the influence of the law on file-share users behavior. In this regard, they highlighted that, before the Napster case, there was excitement about the advantages of file-sharing, but mass infringement of copyright then ensued. They observed that, on the basis of the results of the model simulations, changes made to at least some of the parameters involved would not have altered the ultimate result; e.g., the same outcome would have occurred even if the law in effect had been different. Dr. Zhang and Prof. Schmidt also concluded that the legal system (with respect to the fair use defense) during the 1990-2017 period, both shapes and is being shaped by environmental factors, which are essentially dynamic. For this reason, it is necessary to take into account that the cycle times for these developments is not static. They also remarked that the results can be used as a baseline for a more empirically-based conversation about the formulation of legal policy. Stay tuned for the third part of TILTing perspectives 2017! *First picture is courtesy of Martin Husovec (@hutko).